Note: This piece was originally published in an e-mail sent out to members of a young professionals group called Emerge Montgomery. We reprint it here with Mr. Cole-Tyson’s permission. Part 1 can be seen here. For almost two years now, 2WR (the company where I’m employed) has been working in partnership with the City of Montgomery and The Montgomery Tree Committee to promote a project that will attempt to address the lack of open and green space in downtown Montgomery. The Cypress Pond Park and Greenway is a major component of the promotion of economic development through the creation of green space. We hope that this project will be the first of a series of spaces that will be made for public use in downtown. These may be “pocket parks” to supplement future urban housing, or places embedded in the urban building context, that promote various public events and recreation during the lunch hours and after work. The goal of this project (including Cypress Pond Park and Greenway) is to make Montgomery a place where people want stay. It will help create the economic base to support new jobs, industry and increased property value. 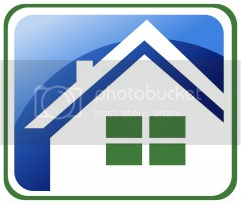 In many cities, property values triple and quadruple because of their proximity to green space. For example, studies of property values in Boulder, CO indicate an average of $4.20 more per square foot for each foot a property becomes closer than 3200 feet from a green belt. Often, urban parks and greenways are designed to re-vision historic transportation infrastructures and waterfronts that have been abandoned by the public of their cities. Completing these projects generates an immediate interest in redeveloping sites with building structures for public and private uses adjacent to these greenways. Health, recreation, and opportunities to engage nature become catalysts for many valuable real estate development projects supporting enhanced quality of life. In addition to increasing economic development and enhancing the quality of life, green space creates an opportunity to address an extremely disturbing statistic that rates Montgomery at the top of the charts for the most obese cities in the country. Promoting green space, recreation, and sustainable transportation is one way of combating this statistic, a problem that begins to be resolved by having all of our daily needs in close proximity to each other to promote a walking, cycling, moving, living city. Allow abandoned industrial properties to be renewed and redesigned into spaces and places that meet the needs of the current generations inhabiting downtown Montgomery. Promote a holistic lifestyle not adapted and programmed around the car. Instead of living in downtown and having to drive several miles to get to the closest park or recreation center, you should be able to walk to this greenway from your residence or office in downtown and safely exercise while enjoying nature. Cypress Pond Park is composed of the 260-acre Cypress Pond area, which flows through Cypress Creek into the Alabama River at a point known as Cypress Inlet immediately upriver from the city’s Riverwalk. It encompasses (1) Cypress Inlet on the Alabama River, (2) Cypress Creek, which runs approximately 1.5 miles up to the (3) Cypress Pond Area, approximately 260 acres east of Lower Wetumpka Road and north of Oakwood Cemetery. The park site is unusual in that it is a large tract of undeveloped land located in close proximity to a downtown business district. The location abounds with landscape diversity, providing scenic views of the City of Montgomery from high bluffs that overlook slopes with three ancient ravines carved by the forces of nature. 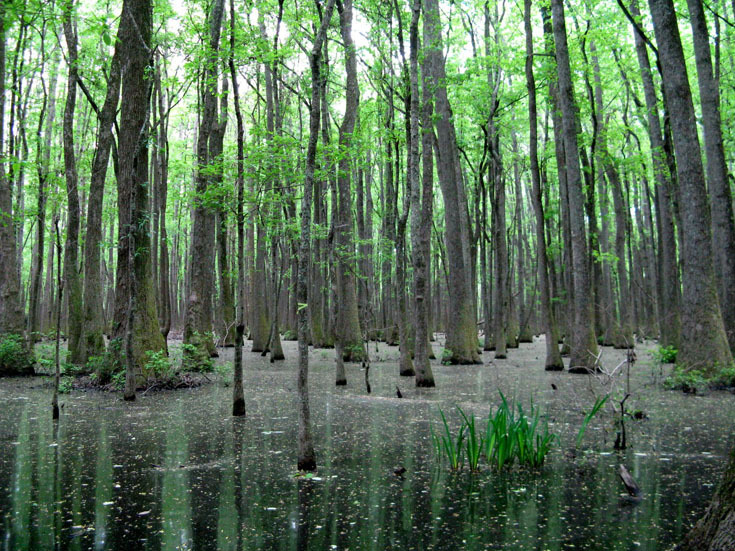 The landscape also features beautiful swampland in the lower regions of the park site. Diversity exists not only in the landscape, but also in the plants and animals living in the area. To date, more than 100 species of birds, 60 species of trees, and 30 flowering plants, as well as numerous ferns, vines, mushrooms, and, of course, insects have been identified in Cypress Pond Park. Once complete, Cypress Pond Park will provide Montgomery with an outdoor environmental education facility and new outdoor recreational opportunities while promoting the conservation and preservation of natural resources. The park will also support the continued economic revitalization of downtown Montgomery by promoting eco-tourism, job creation and business development. To date, a feasibility study funded by the Kodak Foundation and the City of Montgomery has been completed. $100,000 has been allocated to the City by the U. S. Congress to be administered by the federal Corp of Engineers. The City also received a $20,000 donation from a local foundation in early 2010. To date we have had input from many designers; locally, nationally, and internationally, as well as engineers, scientists, non-profits, city, state, and federal entities. The design of this project is coming to life with lots of input from the city and residents. However this design cannot become reality without a good marketing campaign and fundraising strategy and voice and active involvement of young professionals to truly support this effort. As the next generation of Montgomery, we will largely benefit from a project of this magnitude. Our goal now is to increase the number of young professionals who are passionate about promoting this project with their marketing, fundraising, communications, visionary and networking talents. To date, all work associated with this project has been volunteer. However, we are slowly developing a fund for professional services. In the near future we’ll develop a 501c(3) for this project, as well as a “friends group” as a continued effort to market this project to our city. We have occasional tours of the park and will increase the frequency of these tours as the demand increases. To get involved, contact me at 2WR Architects at 334.263.6400 or acole-tyson@2wrinc.com. If you are specifically interested in communications, fundraising or marketing activities, or if you have website design capabilities, please feel free to contact Katie Rose at katie1rose@yahoo.com or 334.399.4681. I truly look forward to getting you plugged in where your talents can best be expressed. Andrew Cole-Tyson is a landscape architect at 2WR, a 40-person architectural firm with offices in the historic Anderson Block Building on Commerce Street in downtown Montgomery, and in Columbus, GA. He views the landscape as an enormous canvas for experimentation and expression of ideas. A naturalist, he is particularly interested in relationships of people to nature and public park spaces. His work includes environmental and site analysis, site and community master planning, horticultural and planting design, irrigation design, graphic design, horticultural consulting and landscape architectural construction document production. Note: This piece was originally published in an e-mail sent out to members of a young professionals group called Emerge Montgomery. We reprint it here with Mr. Cole-Tyson’s permission. 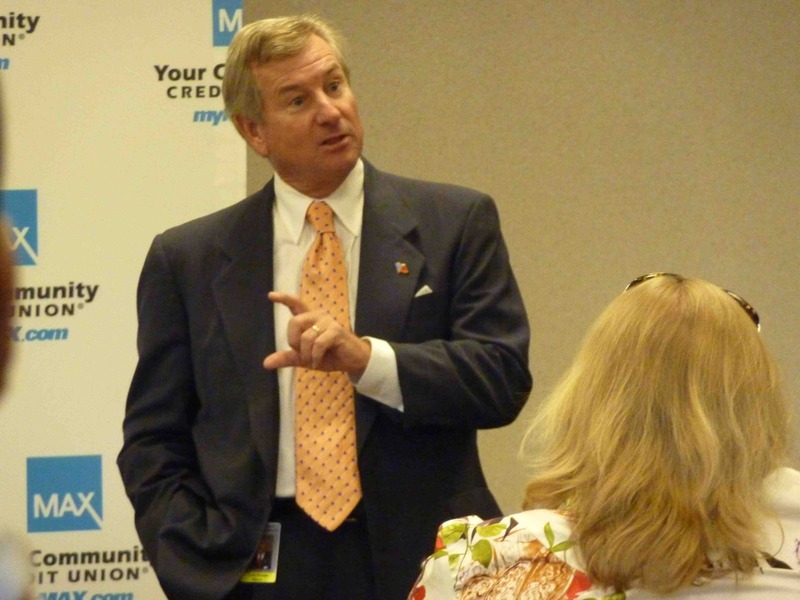 On the evening of July 27, 2010, I attended the event at MAX Credit Union where Mayor Todd Strange spoke to our group of young professionals. The theme, “The Future of Montgomery,” was very relevant and timely. I believe that we are at a pivotal point in the development of our city where young professionals like ourselves can have a true impact by positively affecting the ways that downtown Montgomery will be further renewed and revitalized. As a professional designer interested in landscape architecture and urban design working with 2WR Architects, I see that a large part of the future of Montgomery is related to urban design and architectural retrofit and infill projects as coordinated with the SmartCode. Key to these efforts is the creation of green space in our city. economic development including increased property values and an impetus for revitalization near green areas, business and job creation, tourism management and use, and profits from programmatic entertainment events, etc. environmental benefits in the areas of air, soil, and water management. It is exciting to be here in Montgomery at a time when, if combined, our voices can call attention to ways our city can become a better place for us to live and work. EMERGE Montgomery is made of a phenomenal group of young professionals that have the capability to analyze what is good about other cities that have already made revitalization changes, and lobby for these elements to become a reality in Montgomery. In cities across the south like Chattanooga, Charleston, and Savannah, younger generations are becoming increasingly more interested in the economic and social advantages of mixed use living in urban environments — ways of living that immediately bring up the subjects of green space and the need for a connection to nature for psychological freedom from the stresses of life in the city. Through involvement in increasing green and open space projects, we can take even more advantage of Montgomery’s downtown and waterfront area. The Amphitheater has gone a long way in improving the number of programmed events, but part of the advantage to a large green space near downtown is the capability to enjoy nature at any time without the confines of a structured program, all close to our offices and homes. Green and open spaces are more than tree lined streets, though we do want tree lined streets as well! Green and open spaces are places to connect with nature, and specifically, places that we want close to our homes and offices for the sake of a quick escape. One of the most valuable components of any city is its relationship of green space to the built environment. We’ve seen the impact of green space in places we’ve visited, and maybe even in other places we’ve lived. City planners agree that green space is advantageous, not only for the psychological, environmental, and social rewards, but also for the provable increase in the value of property adjacent to green areas and the other aspects of economic development that are a result of adequate green space creation. When I think of green space, I’m not thinking just about the aesthetics of natural areas, but also about functionality and programming to include all of the things we love to do on a daily basis. Street trees are a good start, but what about interactive spaces and places that we will look forward to embracing on a regular basis? The beauty of having these larger open green spaces in cities is that we can leave our jobs and walk into a nice park that may be programmed for recreation (walking, cycling, hiking, etc. ), musical events or other after-hours events. We understand that there is a lack of public green space in Downtown Montgomery. Perhaps the reason for this is because there’s not a loud enough voice from residents of this city expressing the need for both small and large dedicated green spaces in downtown. Due to the riverfront improvement that sparked more interest in downtown entertainment venues, the perception of downtown Montgomery not being a great place to hang out is rapidly changing. However, when I look at our parks downtown, I rarely see anyone using them for recreational or nature focused activities. And even though as kids most of us enjoyed cycling, I rarely see people cycling. My suspicion is because while the downtown parks that we do have are nice, they are either designed for sitting or programmed events. A person living or working downtown must drive to parks designed for more active pursuits. While the change that has occurred thus far is excellent, my hope is that we can continue to create more green space in our city and maximize its utilization by taking input about its design from younger residents. We first heard about the “Future of Montgomery” program by way of Facebook. Hey, we live in Montgomery! We think about the future! Perfect! The Facebook event told us that the program would be put on by a group called Emerge Montgomery, which we were unfamiliar with, and would be held at a center of civic gathering – the Max Credit Union over near Eastdale Mall. As a sidebar, we learned that Max Credit Union was, according to their conference room’s “Wall of History,” founded with $125 stashed in a cigar box. Leadership Montgomery? Well, that’s here. And the Chamber? Well, you know what a Chamber of Commerce is. · Nim Frazer, Chairman of the Montgomery Area Chamber of Commerce. Dean didn’t show, but the comments by the other two guys were particularly interesting. Most of Frazier’s comments were praise for the members of Emerge and Leadership Montgomery, saying that they were bright leaders of tomorrow, that sort of thing. The people we met were certainly nice enough and very interested in what we did, where we worked, etc. There was a lot of card swapping, name dropping, and conversation about whether so-and-so was the V.P. or the Senior V.P. Frazier’s comments encouraged the audience to join the Chamber of Commerce and participate in their events. He noted that his father was also the head of the Montgomery chamber, and reminded us all of how CNN drove their giant news bus into Montgomery a few months ago and did some reports. But the show was really about Mayor Strange, who talked for about 45 minutes to an hour, all off the cuff, unscripted, without notes. He was casual, fairly open, and quite warm. He came off as candid, while excited about the prospects of the city he leads. It was hardly our first exposure to the mayor, but our longest duration of hearing him talk by far. And he saved plenty of time for questions. Strange began by talking about his arrival in Montgomery at the age of 33 as a regional manager for BellSouth. He said that on his first day of work, he went to meet with the Chamber of Commerce and not only joined, but promptly set out selling memberships. He indicated that he made numerous false promises in order to induce people to join, prompting a great deal of laughter from the audience. He quickly moved into talking about Hyundai jobs and a state bond issue of $5 million, which the city used to purchase the old Colonial Bank building downtown at 1 Court Square, facing the city’s famous landmark fountain. He ran through an impressive list of items that conveyed in addition to the building: laptops, furniture, art. We’d like to hear more about the city’s plans for these items. Current plans for the building involve making some cosmetic changes to the outside of the building, while leasing the inside space to merchants and businesses. Mayor Strange stressed the value of inmate labor, saying that the city employed 20 prisoners to tear down the old Riverside Heights properties. Questions from the audience involved the smart code issues discussed regularly here on MML, the city’s plans for green space, the prospects for a downtown grocery store (upshot: deli likely, full grocery store unlikely), and plans for the abandoned Montgomery Mall. All in all, our first exposure to this whole scene was a positive one. The mayor seemed frank and easy-going. The people from Emerge and Leadership Montgomery were professional and evinced a genuine commitment to the often unrewarding work of civic engagement. The crowd was racially mixed and seemed to have a real interest in making Montgomery a better place. And on a weeknight during the summer doldrums, you really can’t underestimate how important it is that they were able to fill up the room. We’re hoping to continue to follow the activities of this group of “tomorrow’s leaders” and track the difficult work of charity, community improvement, and civic participation. Groups like this are one of the many driving engines that make democracy work. Kate and Stephen are Midtown residents with a dog, a cat, a garden, an old house and a sense of adventure. They write about life in Midtown here and about life in Montgomery at their blog Lost in Montgomery. Bye Bye Bel Aire—Hello, Hornet Football!